This is a shamelessly nosy post, for the shamelessly nosy nifflers among you. Gather round chums, we’re all friends here. Friends with an unhealthy interest in the contents of other people’s make up bags. So this is what is in mine. (I’m not counting the random bits scattered around the house and lurking in various handbags. They get to come out and play another time). In a system that only makes sense to me, I have 3 make up bags in daily use. Even though I don’t think I wear a lot of make up but I do like to have a choice. And BTW, for complete transparency, these products are a mix of items I’ve been sent and things I’ve bought. So if it’s a PR sample I will mark it with an asterisk * and link to the original review. If you spot anything here you’d like to know more about, ask me in the comments and I will bore on for Ireland so much, you’ll wish you never asked. 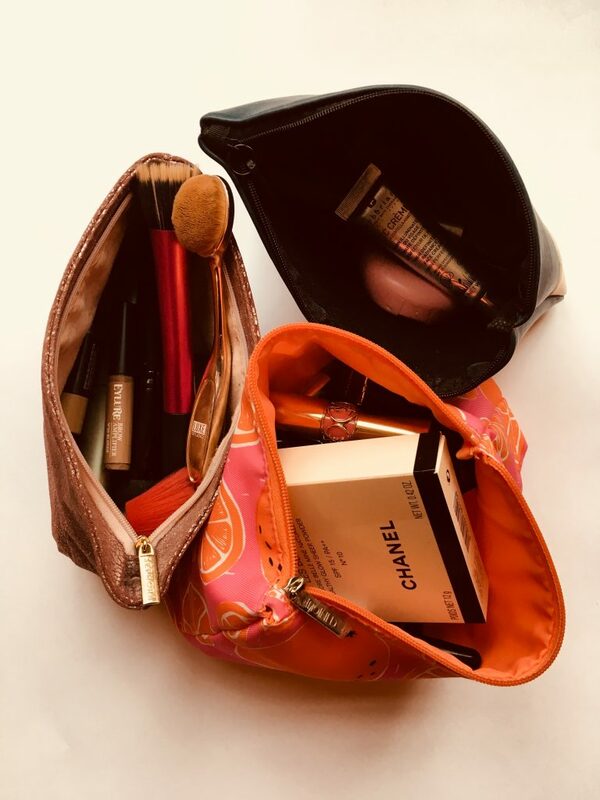 Make up bag 1 – the orange Clinque bag – is for fancy make up, ie if it’s a brand you’ve heard of, and/or I paid more than a fiver for it, it gets to live in here. As you can see, I got some Chanel powder for Christmas and I can’t bring myself to throw away the box yet. Do you do that? Or do you just cast away the packaging like some devil-may-care barbarian? I also got two lovely YSL lipsticks for Christmas which are just a real pleasure to use. 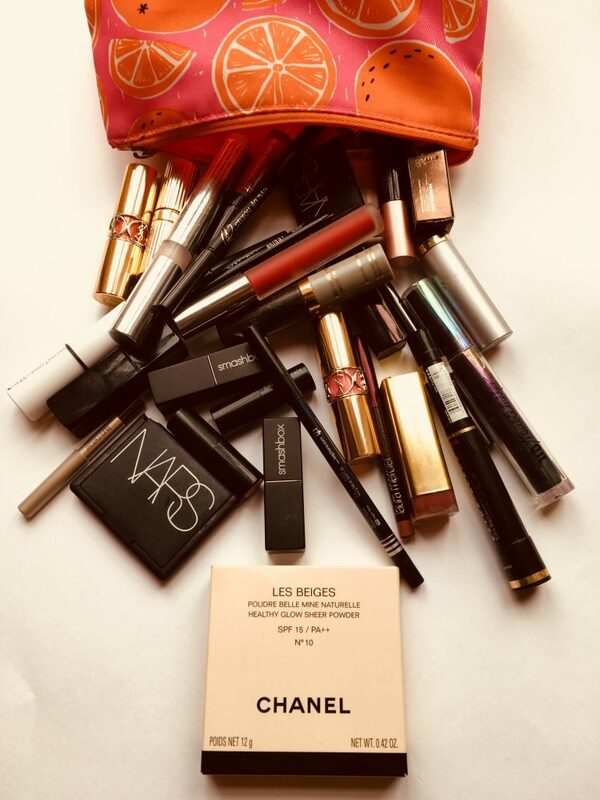 Other treasures include the Smashbox lipsticks*, Urban Decay mascara* and lipstick*, NARS blusher & bronzer, Joan Collins lipsticks* and Laura Mercier eyeliner and lipliner. There’s not much in the way of black eyeliner, though I have a dark grey Burberry one, a brown Eye of Horus eyeliner and a navy Sephora one. Black eyeliner just seems so boring now when there are more fun choices out there. 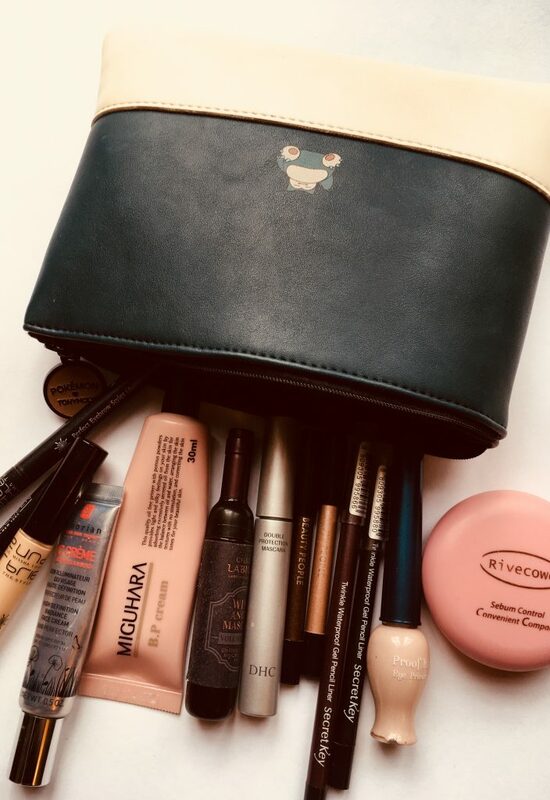 Speaking of fun, Make up bag 2 – the TonyMoly Pokemon bag – is for Korean make up. I don’t really have enough Korean make up to justify a whole bag, it’s Korean skincare that’s more my thing. But that Pokemon make up bag is so cute it has to be used BY LAW. My favourite product in here is the Miguhara BP cream. This is a very silicone-heavy cross between a BB cream and a primer that does a great job of smoothing everything out. There’s a glittery green Secret Key eyeliner for wearing to the gym, the excellent Missha Under Eye Brightener, DHC mascara*, and Etude House primer lurking too. 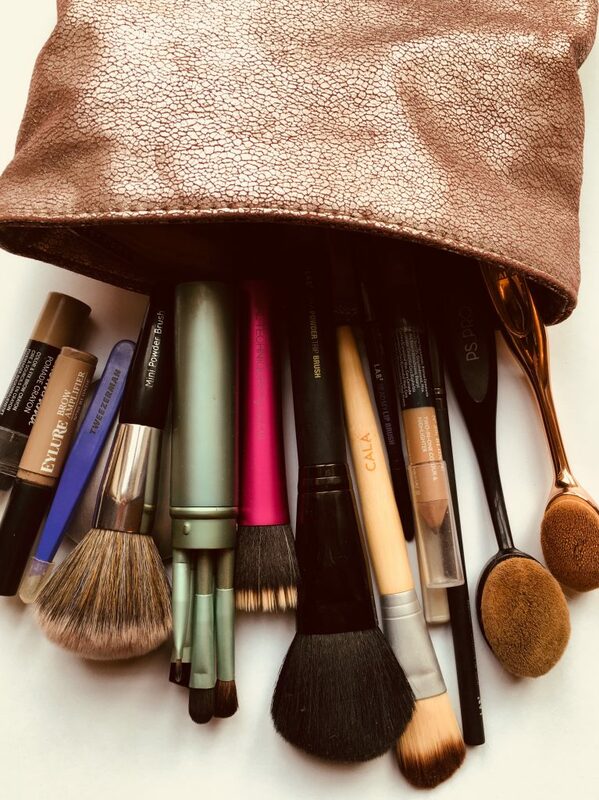 Make up bag 3 – the rose gold Sephora one – is for tools and eyebrow stuff. I have such white blonde eyebrows, I need a whole sack of stuff to paint them in. The brushes, including L.A.B.2* and Luxe Studio* tend to be on the cheapie side. I’m not convinced that a pricey brush makes that much difference. What’s not in there? Foundation, for starters. I do like a squidge of Korean BB cream, but I haven’t found a foundation that suits my late 40s, pale as milk, skin without looking too heavy. Any recommendations? And there’s no eyeshadow becasuse I can’t fit my Urban Decay palettes* in the bags, though I do use them every day. Leave a comment, I’d love to hear from you. 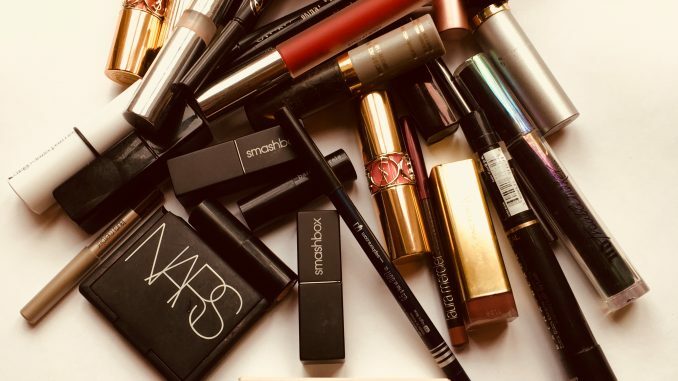 What’s your favourite product in your make up bag?